Tired of the same old guest book? So are we! And you have so many other options thanhaving your guests just sign their names. 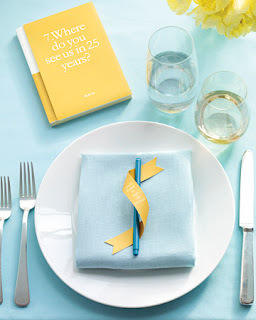 For today's Do-it-Yourself project we are featuring these adorable guest books from Martha Stewart Weddings. 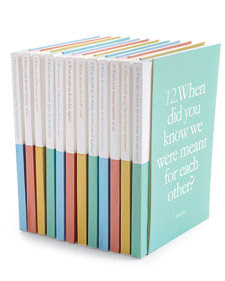 These clever guest books will be far more interesting to read after your wedding. 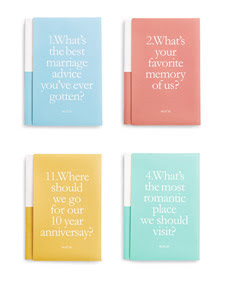 Each cover asks the guests questions such as "What's your favorite memory of us?" and "Where should we go for our ten year anniversary?" 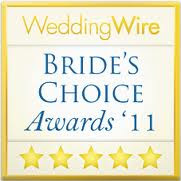 You may find their answers to be sweet, funny and even helpful! To make these books, just download the PDF from Martha's website and attach to a plain notebook. Place these on each of your dinner tables for your guests to fill with their wonderful wishes and stories! Are you doing something different for your guest book? We would love to hear about it!